These jumbo pasta shells are filled with a mixture of chicken, Monterey Jack cheese, cilantro, diced jalapeno, taco seasoning, corn, black beans, and cream cheese. Once the shells were filled, I topped them with salsa with more shredded cheese and baked them in a preheated oven. Just before serving, I sprinkled some fresh cilantro and served them with sour cream and guacamole. 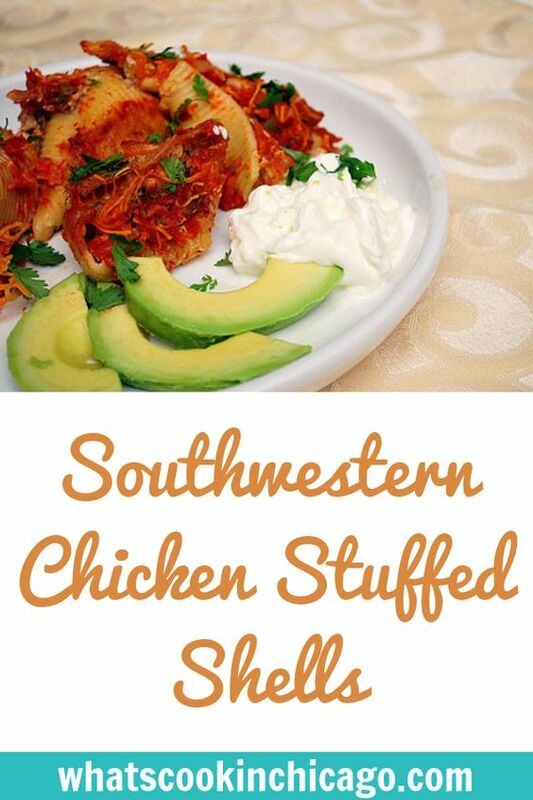 Feel free to tweak this to your tastes and what ingredients you have on hand. Hopefully before you throw out that food, you can use it to create a filling and fill away! Cook pasta shells as directed, drain and set aside. Combine chicken the 1 cup shredded cheese, chopped cilantro, diced jalapeno, taco seasoning, corn, black beans, and cream cheese. Toss to combine; set aside. To prepare sauce, heat oil in a large skillet over medium-high heat. Add onion, bell peppers, and garlic; sauté until tender. Add the remaining sauce ingredients and bring to a simmer, cooking for 20-25 minutes until slightly thick. In a 13 x 9 baking pan, lightly grease with cooking spray. Cover bottom of pan with a thin layer of sauce. 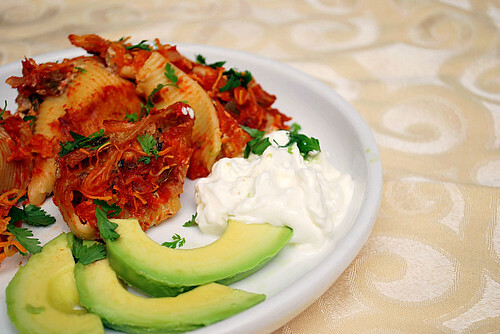 Fill cooked pasta shells with filling & arrange stuffed shells in a single layer in pan; top with remaining sauce. Sprinkle with 1/4 cup shredded monterey jack cheese over sauce. Bake at 350° for 40 minutes or until bubbly. Before serving, garnish with more chopped cilantro and serve with sour cream and slices of ripe avocado (or guacamole). I made mexican stuffed shells once and they were one of my favorite stuffed shells ever!